If you’re like most of us, you’ve experienced the occasional (and memorable) cold shower when too many family members’ showers deplete your hot water supply. Similarly, who hasn’t complained when paying their monthly water bill? Stop griping over water heater woes and implement a plan that prevents major headaches—and flooding—later on. These five cost-saving tips prolong your water heater’s life. Insulate exposed pipes and your water heater tank. It’s relatively inexpensive to purchase insulating liners for both your pipes and heater. Hint: If your heater is new, it’s probably already insulated. Also avoid insulation around the thermostat, air inlets, and exhaust outtakes. Turn down the thermostat a few degrees. You won’t sacrifice warmth if you keep the temperature lower than pre-sets (which are often too hot and increase scalding risks). More importantly, you save energy costs and reduce mineral build-up inside the tank. Drain your tank periodically to reduce sediment. Turn off the water heater’s power. Then attach a hose to the cold-water supply valve near the bottom. Aim the hose at your basement drain or into a large bucket. Once the water turns clear, close the valve, refill the tank, and turn on the power. Check the anode rod every three years. Unscrew the rod from the top of your unit and inspect it for calcium and mineral deposits. If it’s completely coated or less than 1.27 cm thick, it’s time to replace it. Ignoring it may lead to a rusting tank interior and leaks. Use less hot water and save money. Install low-flow showerheads or faucet aerators to make your shower more efficient. Set your dishwasher to an energy-efficient setting. 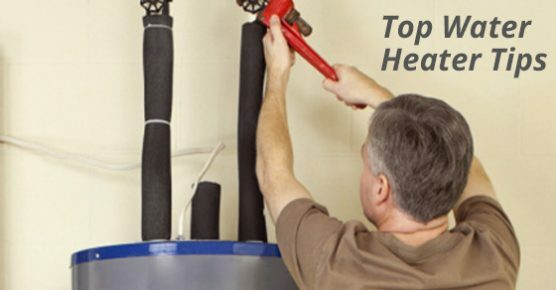 Want even more water heater care tips? Contact your Advanced Plumbing experts today.